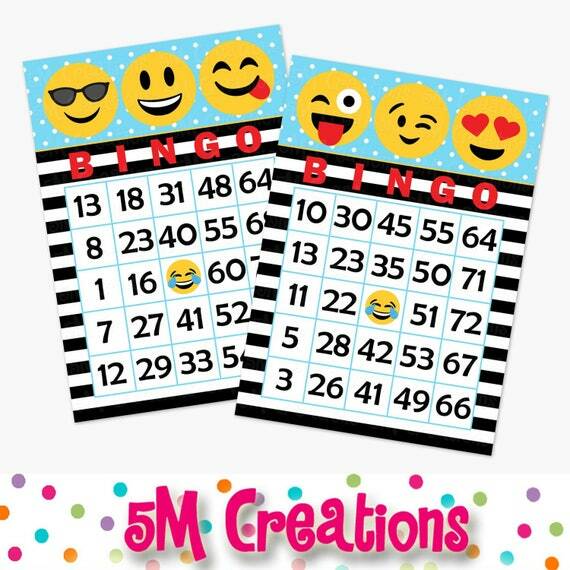 This INSTANT DOWNLOAD listing is for a digital file of our printable Emoji Bingo Card. This file includes 24 different cards, a calling card, and numbers to call. You will receive a high resolution file of a 2 (5x7) cards per page on an 8.5x11 sheets. Print at home or at your local printer. We recommend printing on 80lb -110lb card stock or photo paper. Cut out the cards and play. A set of 24 cards is also available if you need a larger set. Please message me for more info. A matching invitation and party decor package are sold separately. Message me for any special requests prior to purchase to purchase. NO RETURNS or refunds on INSTANT DOWNLOAD files.